model of a planned community and is now preparing for a new phase of vitality with a major redevelopment plan. for dining, shopping, recreation and entertainment right in the county. businesses which call the county home. Includes Cities/Towns: Annapolis Junction, Brookeville, Clarksville, Columbia, Cooksville, Dayton, Elkridge, Ellicott City, Fulton, Glenelg, Glenwood, Hanover, Highland, Jessup, Laurel, Marriottsville, Mount Airy, Savage, Sykesville, West Friendship, Woodbine, Woodstock. 95 miles of paved hiking, walking, biking trails, shops, restaurants. It's all here. Art galleries, theaters,museums and several very popular festivals throughout the year create a vibrant arena for all interests. 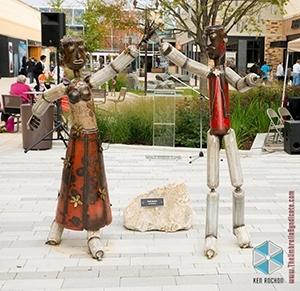 The Howard County Arts Council works year-round to foster the arts in the county. It provides grants to support the arts and operates a multi-purpose art center in Ellicott City where visitors can take a class, view an exhibit, or enjoy a performance. The Columbia Art Center, run by the Columbia Association's Community Services Division, also provides experiences in the visual arts for all ages and interest levels. The Art Center offers rotating gallery exhibitions, year-round art classes, summer art camp for children, birthday parties and more. Other art exhibitions are held at two galleries at Howard Community College: the Rouse Company Foundation Gallery and the Art Department Gallery. Artists also display their work in a number of local restaurants and shops and in independent art galleries. The Columbia Association (CA) also offers free music, movies and dancing every night of the summer months through its Lakefront Summer Festival. The Columbia Archives, which is part of CA, has exhibits, events and seminars to share the history of the planned community. Howard County is ideally located on the I-95 highway corridor, with easy access to Baltimore and Washington, D.C., and numerous transportation options to go across the county or throughout the U.S.
Hopkins Medicine, which provides health services to more than 220,000 people per year. In addition, the Baltimore region is well known for providing care and treatment on the leading edge of medicine with resources including The Johns Hopkins Hospital, University of Maryland Medical Center, several MedStar facilities and at least 10 other hospitals that have been highly ranked. Jan 22.7 F° 31.9 F° 41.1 F° 3.5 "
Feb 24.6 F° 34.9 F° 45.2 F° 3.0 "
Mar 32.2 F° 43.4 F° 54.6 F° 4.1 "
Apr 40.6 F° 53.1 F° 65.6 F° 3.5 "
May 50.7 F° 62.9 F° 75.1 F° 4.6 "
Jun 59.5 F° 71.4 F° 83.2 F° 3.9 "
Jul 64.4 F° 76.0 F° 87.5 F° 3.9 "
Aug 62.7 F° 74.2 F° 85.6 F° 3.7 "
Sep 55.6 F° 67.3 F° 78.9 F° 4.2 "
Oct 43.3 F° 55.5 F° 67.7 F° 3.5 "
Nov 34.7 F° 45.5 F° 56.3 F° 3.6 "
Dec 27.0 F° 36.3 F° 45.7 F° 3.5 "
Spring temperatures are cool with averages in the low 50's and highs in the mid 60's. Nights are cold with lows in the low 40's. Summer temperatures are mild with averages in the low 70's and highs in the mid 80's. Nights are cool with lows in the low 60's. Fall temperatures are cool with averages in the mid 50's and highs in the upper 60's. Nights are cold with lows in the mid 40's. Winter temperatures are cold with averages in the mid 30's and highs in the low 40's. Nights are cold with lows in the mid 20's.